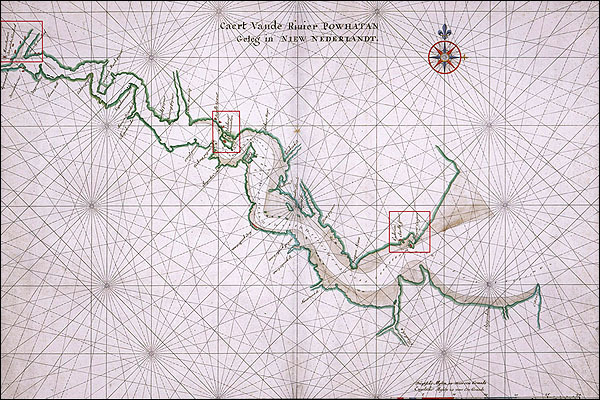 This chart entitled "Caert Vande Riuer POWHATAN Geleg in Niew Nederlandt" was drawn by the Dutch cartographer, Johannes Vingboons after 1638 from ca. 1617 ships' logs. It was included in the his publication of Atlas of the Dutch West India Company. It illustrates Jamestown, individual houses around modern Hopewell, and two other early Virginia forts: Fort Algernon at Point Comfort and Charles Fort at Strawberry Bank. It is significant in its illustration of the Jamestown fort as not being at the western site previously thought to be its location.